Want to know what goes on behind closed kitchen doors? F&W does some digging and finds out what chefs are eating and cooking. Here, what they’ve enjoyed this past week. 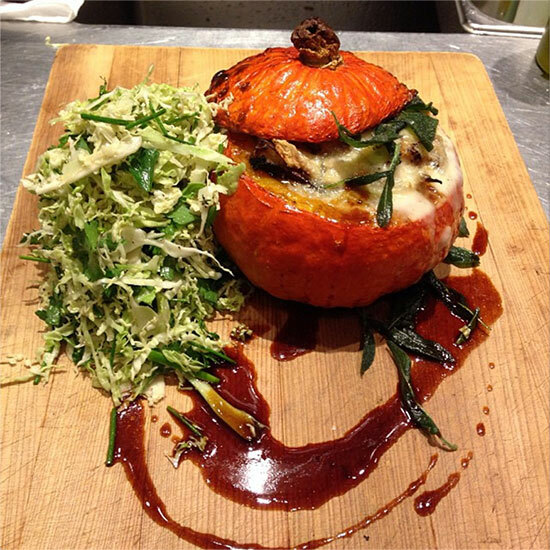 Kabocha Squash for 2: At Incanto, chef Chris Cosentino is working on a new dish: Kabocha squash stuffed with oxtail, Savoy cabbage, grilled levain and Taleggio. The gooey, cheesy fall dish is perfect for F&W’s new #FWMuse series, which spotlights squash this month. Beautiful Beets: Paul Liebrandt plated a breathtaking, deconstructed salad of early autumn beetroot, lettuce, flowers and herbs. Breakfast Pie: Alexandra Guarnaschelli proposes raspberry jam tarts for breakfast. “What is it about a lattice crust that makes things taste better?” she asks. Chickpeas at Betony: On a trip to NYC, Hugh Acheson snacked on delicate chickpea panisse at Betony. His verdict: Stunning. Halloween Macaroons: In a stroke of genius, chef Andrew Carmellini’s Lafayette is selling “Jack-O-Roons” for the Halloween season. Bright orange, dipped in chocolate and topped with frosting stems, the cookies even have Jack-O-Lantern-inspired faces.